You've told your friends. You've worn our badge loud and proud. You've sent us new show information. You've brightened our day with your kind and encouraging comments. You've kept the system working and helped to make the site great, and I thank you! Your support has been so overwhelming, you inspired me to create a couple of official sponsorship options for any of you who might be interested. You may have noticed that DFWCraftShows.com has some colorful new badges of it's own. I am now offering ad space on our site to any Arts&Craft Shows, Artists, Crafters, or services for them. Ad space starts as low as $5 a month, and will be featured on all pages of our website. The location of your ad will rotate randomly to ensure maximum exposure. If you are interested in purchasing Ad Space, please email us at dfwcraftshows@gmail.com with your ad selection. DFW Craft Shows recently had it's very first giveaway. Feedback was great, and I would like to continue them. Sponsoring a Giveaway is a great way to promote your shop, service, or show, as well as gain exposure for your handcrafted goods, services, or events. Giveaway Sponsors will be featured on the DFW Craft Shows website and Facebook/Twitter pages, along with the item(s) they have donated. Sponsors will be entered into a queue based on the order in which their emails are received, and will be notified before their item/giveaway is posted. And don't forget, winning a giveaway is a great way to get your name into the DFW Craft Shows blog as well! If you are interested in participating as a Sponsor, please email us at dfwcraftshows@gmail.com with the sponsorship flavor of your choice. Participate and Win an Entry into Our Newest Giveaway! 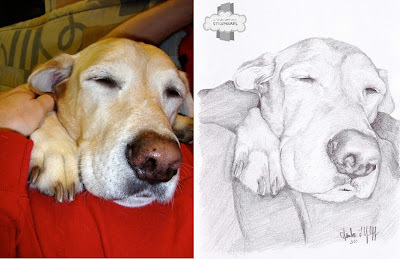 Amber of A Shade Better Than Stick Figures creates beautiful hand drawn portraits from your favorite photographs. She is giving away a CUSTOM hand drawn 8X11 portrait, a $50.00 value, to the winner of this DFW Craft Shows giveaway! Check out her blog and website for many, many examples of the portraits she has drawn over the years. Simply email us the sponsorship flavor of your choice, and then leave a comment on either our website or Facebook page. Sponsors will be granted 1 entry per Flavor they choose and winners will be announced the morning of Wednesday, April 21st. Sarah, the "flavors" are just the two different kinds of sponsorship available. You can either take out an ad, starting as low as $5, or you can sponsor a giveaway for DFWCS. To enter the giveaway, you simply let us know which you would like to participate in and you could win a custom drawing from A Shade Better Than Stick Figures! :) I hope that clears things up!